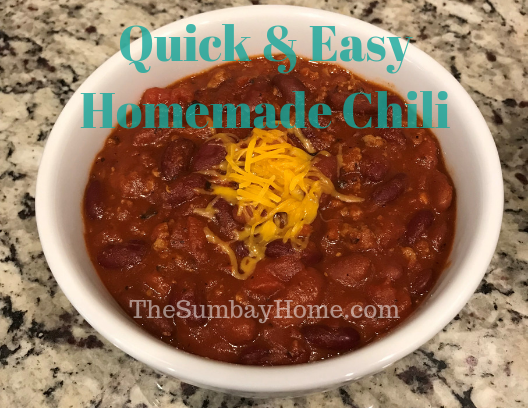 This quick and easy homemade chili recipe is perfect for those busy nights. It can be ready in as little as 30 minutes and the whole family will be pleased. We make it with ground turkey, and it tastes just like a beef chili. But if ground turkey is not your thing, just replace it with a pound of beef and it will be just as good. Things get very busy around here on weekdays and weekends, and I’m sure the same happens in your home. Since nothing beats a home cooked meal, we’re constantly looking for ways to make delicious meals in a short amount of time. If you are looking for the same, follow our Quick Dinner Ideas board on Pinterest. This board only shows delicious recipes that you can make in 30 minutes or less. Here is almost everything you will need. The only addition is a bit of salt and a 28 oz can of crushed tomatoes. 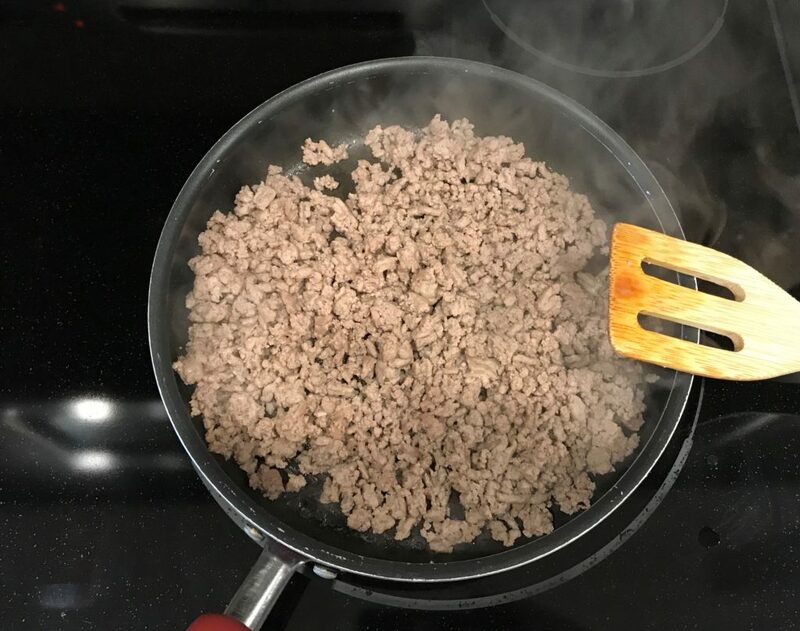 Start by cooking the ground turkey (or beef) on medium heat. This will take roughly 7 to 10 minutes. While the ground meat is cooking, you will need to use a flat tipped wooden turner to break it up into smaller pieces. 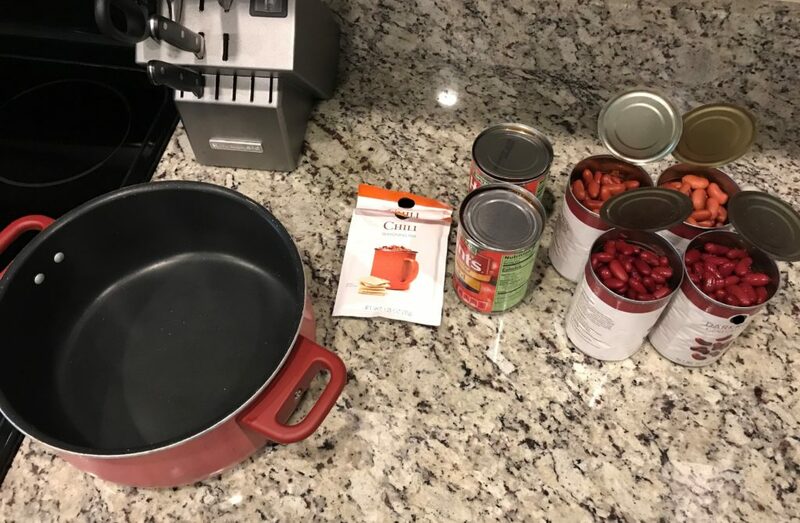 While the turkey (or beef) is cooking, open all of your cans of beans and tomatoes. You will need to wash and strain your can beans several times. You can put all of the beans into a colander and wash them, or simply rinse them out in the can several times. Just be sure to drain all the water from the cans when you are done. Check the meat, and keep breaking it up and stirring it in the pan. 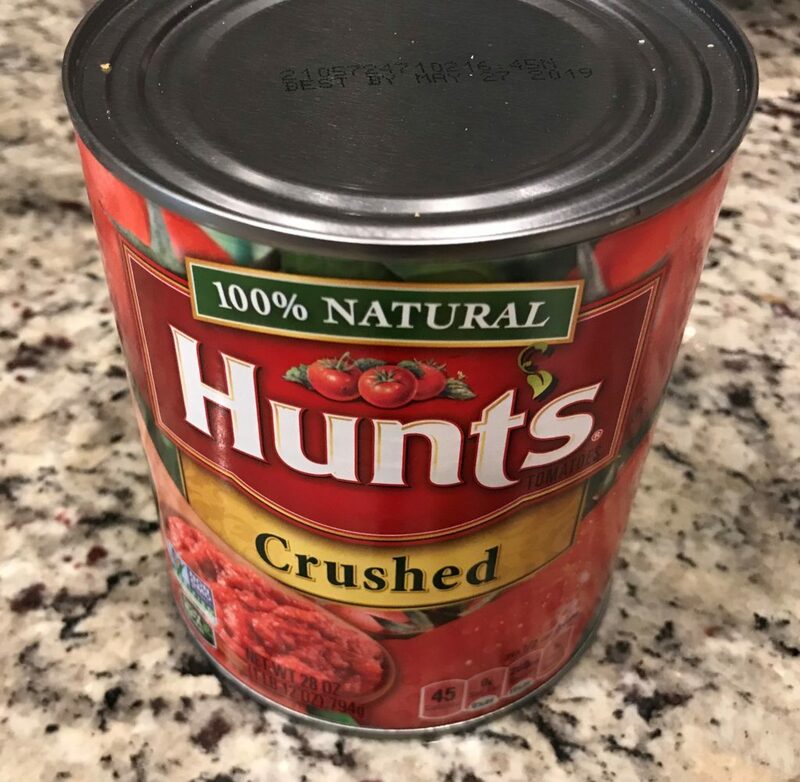 Don’t forget the crushed tomatoes, I almost did. By the time you are done opening all of your cans and rinsing your beans, the meat should be pretty much done. I like to cook it until all the excess moisture is gone. Grab a large stockpot with a tight-fitting lid ( I’m using a 6 quart here) and start putting everything in. 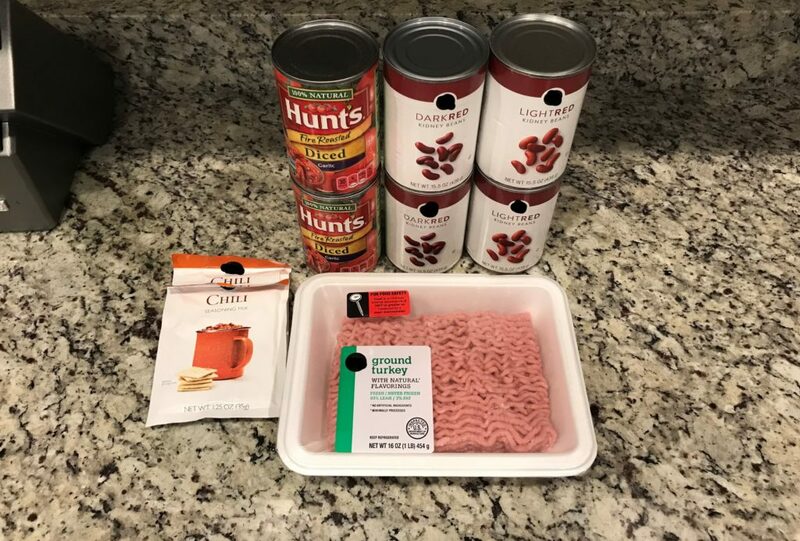 I like to start with the ground meat, diced tomatoes, beans, crushed tomatoes, 2 packs of chili mix, and a teaspoon of salt (optional) on top. The order is not that important here, we’re going to be continuously stirring it. You can find the whole recipe below. Start now by mixing everything up very well. If you are curious what pans I’m using, they are the Paula Deen Signature Nonstick Porcelain Cookware Set. They are amazing!! I have had mine for several years and they are still holding up great. The best part is all the neat colors you can get them in, and the quality of the cookware of course. Cover the stockpot and cook on 3/4 heat. We are basically cooking this on high heat for at least 15 minutes. However, we will need to keep an eye on it and stir it up every few minutes during this process. We want a moderate boil, so if it’s not boiling enough just turn it up, but don’t walk away from it. If it starts boiling too much and splattering out of the pot, turn it down a bit. 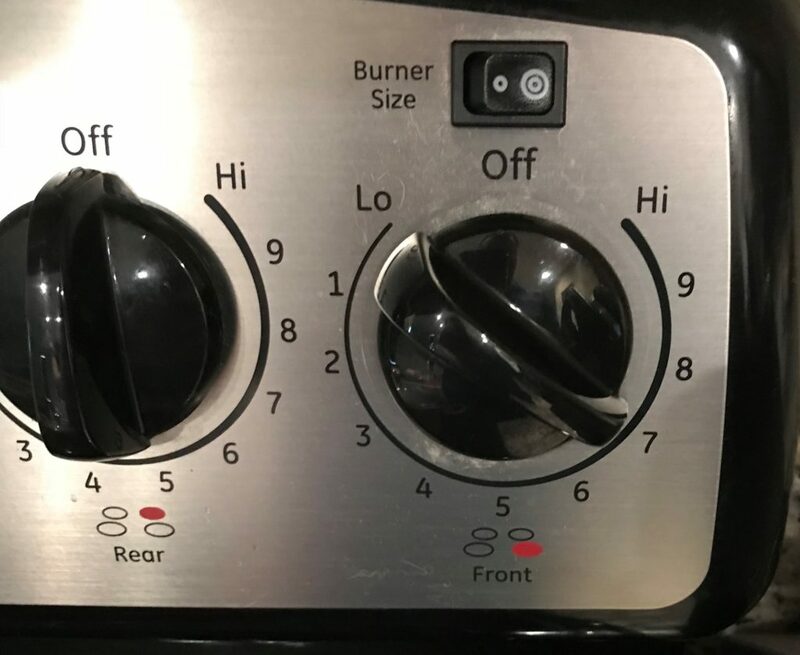 The picture above shows the sweet spot on my stovetop for this, but they are all different. 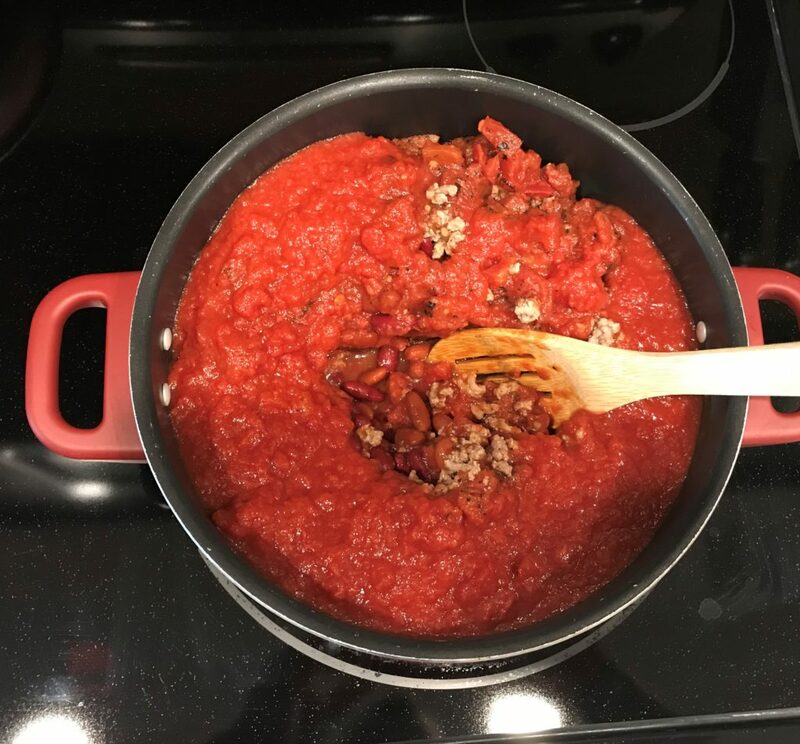 Since we are cooking this on high heat, it will need to be completely stirred every few minutes to prevent the tomatoes from burning. If you have a few extra minutes to let it simmer before serving, it will only enhance the flavor. Just keep in mind that it will be extremely hot, and might need a few minutes before serving. 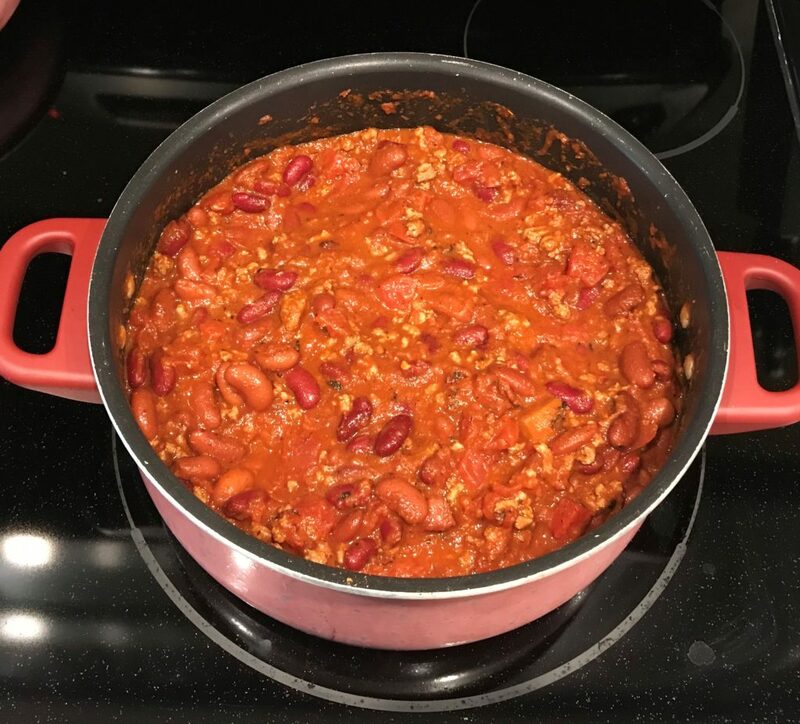 Once the chili is done cooking, you can leave it covered on the stove (on low or simmer) for up to an hour before eating it if necessary. This is one of those things where the longer it sits, the better it gets. Usually, cooking chili takes time, and if we had the time I would rather put this on low heat and let it simmer for hours. What we are doing it cooking it on high heat for a short amount of time. 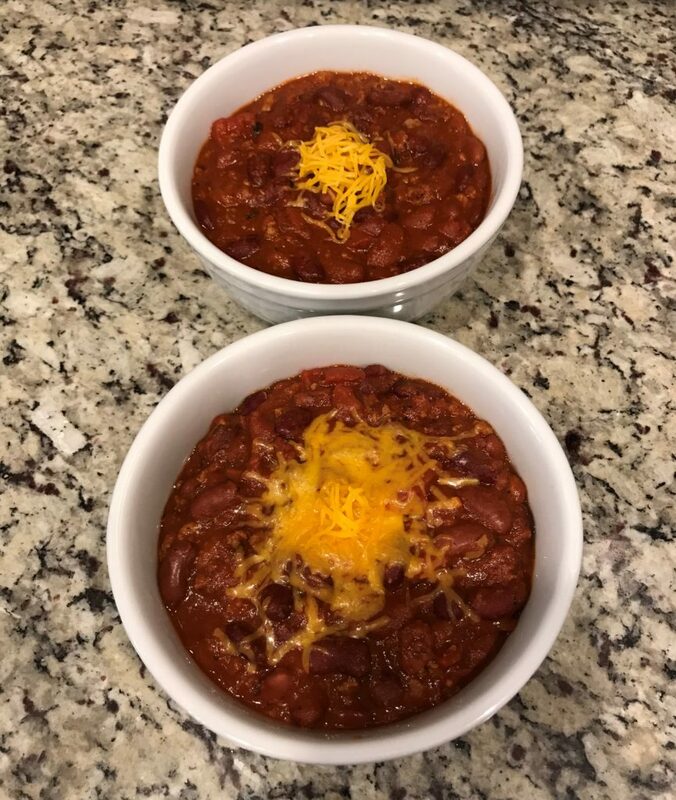 We are still ending up with a flavorful chili, but if we let it cook for hours it would turn out a little bit better. 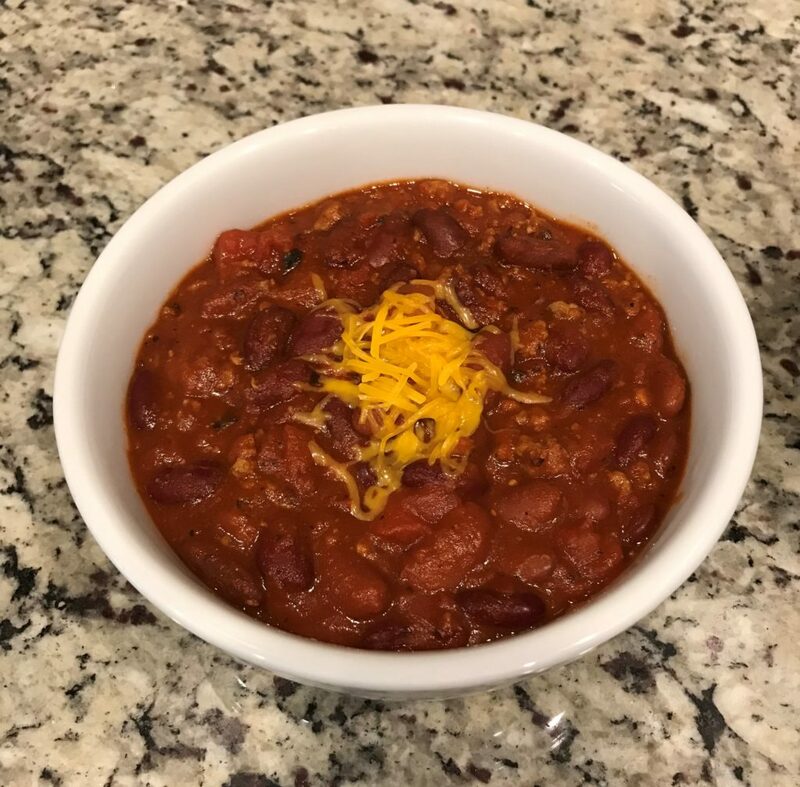 With this chili recipe, it always tastes better the next day, because all of the ingredients have had the time to just sit and blend together. But you can’t beat it for a homecooked meal that’s ready in 30 minutes. After 15 minutes of cooking and stirring, the chili is ready to serve. Enjoy! Just make sure to enjoy it the way you like to eat your chili. We top ours with a little bit of cheddar and eat it with tortilla chips. Both of those things add the needed salt to the chili. So personally, we don’t add the salt while cooking. If you eat your plain, you might need to add it while cooking. 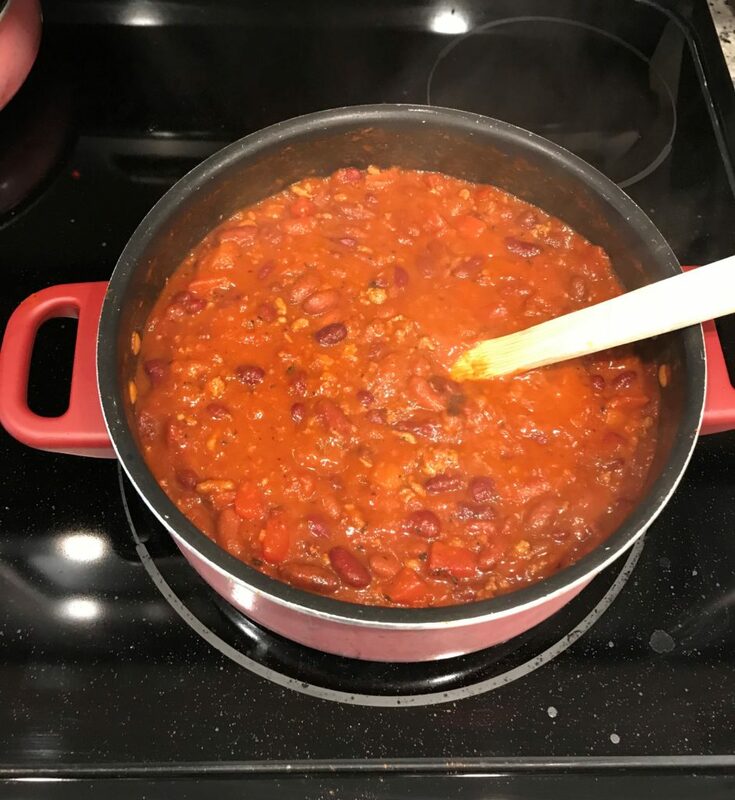 Either way, it’s always better to add the salt to the bowl if needed and not take the chance of overdoing it in the whole pot of chili. 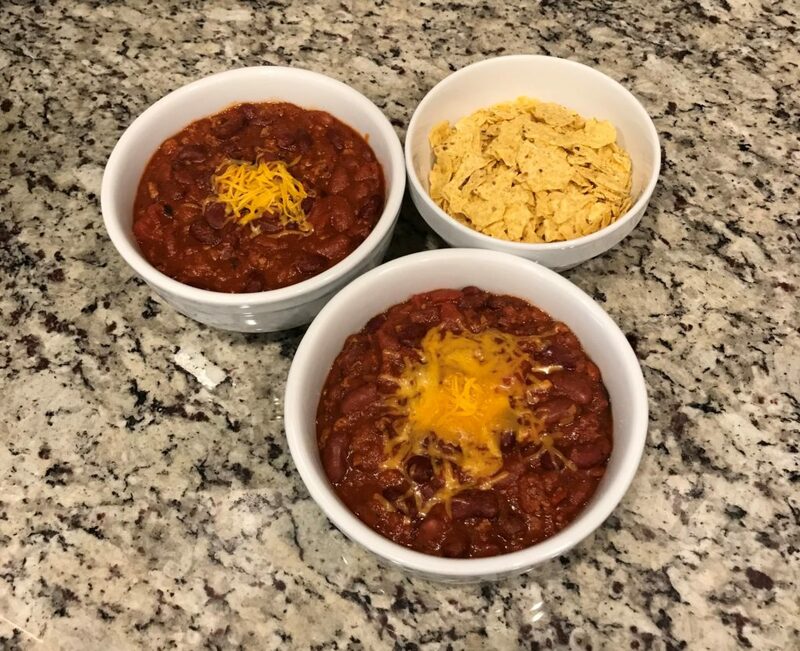 Thanks for stopping by, we hope you enjoy this delicious homemade chili recipe and enjoy the amount of time that it saved you on preparing this meal for your family. Stay tuned for more 30 min recipes to come. 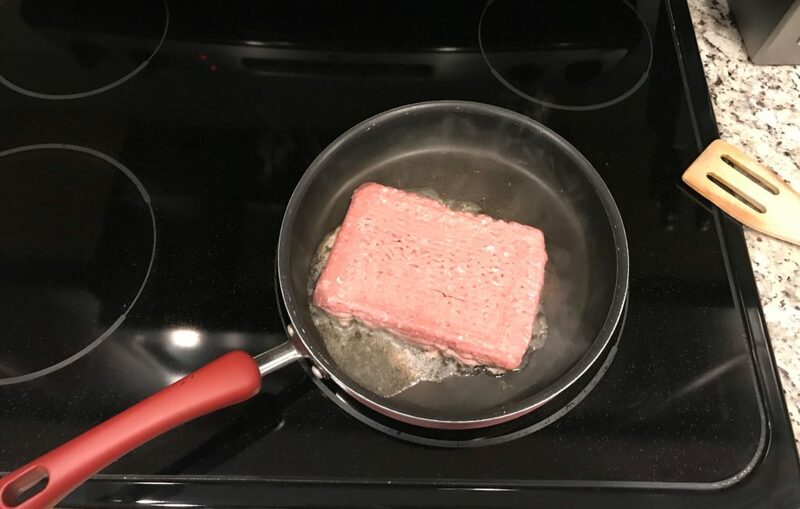 Start by cooking the ground turkey (or beef) on medium heat in a pan. This will take roughly 7 to 10 minutes. Use a flat tipped turner to chop the ground meat up into small pieces while cooking. Open all cans, then drain and rinse beans. Rinse several times using a colander or in the cans. Add all ingredients into a large stockpot (I’m using a 6 quart). Then thoroughly mix all the ingredients using a large spoon. Cook on high heat (3/4 stovetop heat) stirring every few minutes, for 15 minutes. Keep covered when not stirring. Since we are cooking this fast, you will need to keep stirring it to prevent it from burning. Enjoy! But be careful, chili might be hot.